Be the first to share your favorite memory, photo or story of Lucy . This memorial page is dedicated for family, friends and future generations to celebrate the life of their loved one. 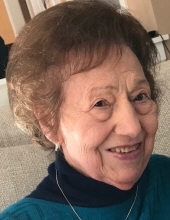 WINSTED – Lucy (Mangione) DeSanti, passed away peacefully on Wednesday, January 23, 2019. She was the wife of the late Angelo “Ange” DeSanti for 66 years. Born December 21, 1925 in Santa Caterina, Italy; the daughter of the late Charles and Carmela Mangione. Lucy co-owned and operated Laurel Lanes in Winsted with her husband for many years. She enjoyed cooking and loved spending time with her grandchildren. She is survived by her daughter, Lynette McCarthy (Bob); grandchildren, Paula Tycienski-Russo (John), P.J. Tycienski (Eden), Darren McCarthy (Ashley) Kevin McCarthy and Drew McCarthy; great grandsons, Ty Russo, Nico McCarthy and Patrick Tycienski; sister, Mary Gendreau; sister-in-law, Lois Mangione and several nieces and nephews. In addition to her husband, she was predeceased by her daughter, Patricia Tycienski and siblings, Flora Diulio, Fran Gelzinis, Jenny Diulio and John Mangione. Friends may call on Sunday, January 27, 2019 at Montano-Shea Funeral Home, 922 Main Street, Winsted from 5 – 7 PM. A Mass of Christian burial will be held on Monday, January 28, 2019 at St. Joseph’s Church, Winsted at 11 AM. Burial will be at St. Joseph’s Cemetery in the spring. In lieu of flowers, memorial donations may be made to: VA CT Health Care System, Voluntary Services, 950 Campbell Ave., West Haven. CT 06516. Visit an online guestbook at montano-shea.com. To plant a tree in memory of Lucy (Mangione) DeSanti, please visit our Tribute Store. "Email Address" would like to share the life celebration of Lucy (Mangione) DeSanti. Click on the "link" to go to share a favorite memory or leave a condolence message for the family.